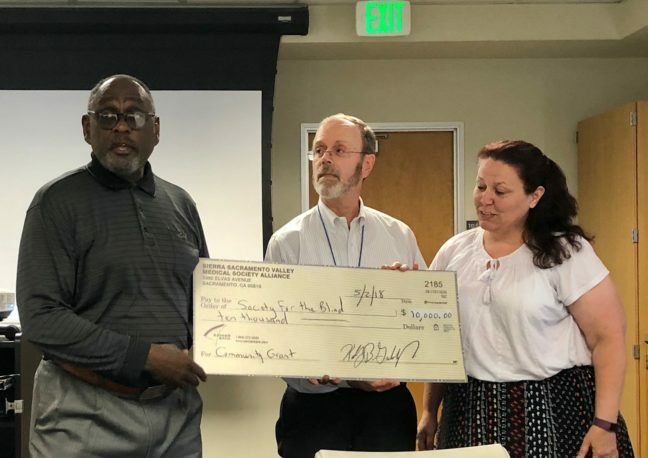 Seniors with vision loss in the Sacramento region will receive assistive tools and technology, thanks to a $10,000 grant from Sierra Sacramento Valley Medical Society Alliance. The grant will help fund Society for the Blind’s Senior IMPACT Project that empowers people 55 and older with alternative, non-visual techniques and skills that enable them to perform day-to-day tasks and activities so they can maintain or increase their independence. The Senior IMPACT Project includes an eight-day retreat offered monthly at Society for the Blind that gives seniors an immersion experience where they learn alternative techniques and skills to travel safely, efficiently and independently. They practice alternative techniques and use adapted tools to perform tasks of daily living including cooking, cleaning, shopping, home maintenance, organization, personal finance and more. They learn how to use the latest in assistive technology to operate computers and mobile devices for home, school and work, and they learn Braille. Participants receive individualized attention from instructors and mentors who are blind or low vision, and they have the opportunity to join in discussion groups with peers on issues around vision loss and participate in community activities. For those unable to attend retreats, Society for the Blind sends instructors to their homes to teach skills and offer resources. The Senior IMPACT Project also includes monthly peer support groups for English and Spanish speakers and workshops throughout the year. For more than 60 years, Society for the Blind has created innovative ways to empower individuals living with low vision or blindness to discover, develop and achieve their full potential. Society for the Blind has grown from a dedicated group of volunteers to a nationally recognized agency and the only comprehensive rehabilitative teaching center that provides services for a 27-county region of northern California. The nonprofit provides low-vision eye care, life and job skills training, mentorship, and access to tools to maintain independence for 6,000 youth, adults and seniors experiencing vision loss each year. For more information or to make a donation, visit SocietyForTheBlind.org. The Sierra Sacramento Valley Medical Society Alliance is a nonprofit dedicated to improving the quality of health in the community through education, funding and volunteer support. For more information, visit SSVMSA.org.